When set to 'On', the Scheduler button in the main window will appear, allowing access to the scheduler feature. If this setting is switched to 'Off', all information in the Scheduler View will be saved, the Scheduler button will disappear, and no tasks will be executed. This option will add a Scheduler sub-menu to the popup menus in the Transfers and/or RSS view. This sub-menu can be used to included or excluded specific Feeds or Transfers from any scheduler task, or create a new task including the selected Feeds or Transfers. 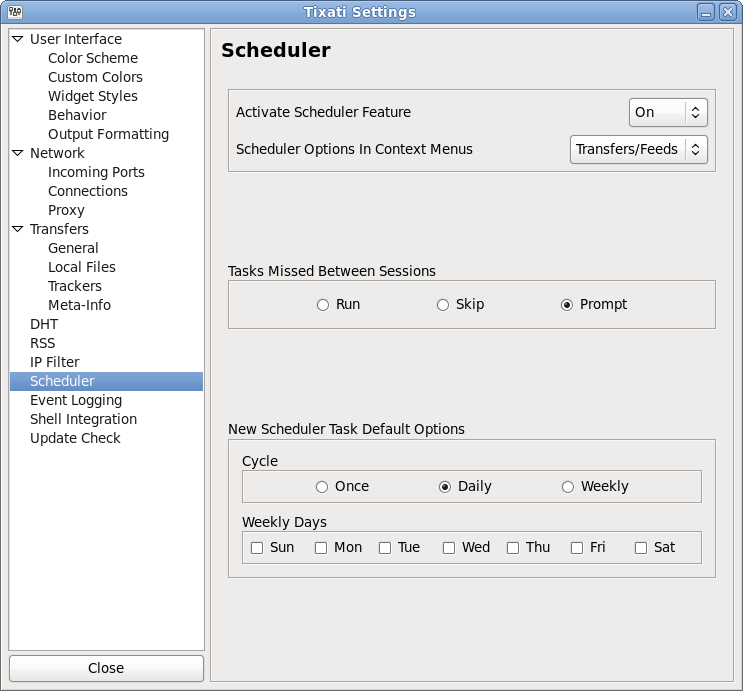 If tasks were scheduled to execute when Tixati was not running, this option will control what happens when Tixati restarts. If the 'Run' option is selected, the tasks will be executed in chronological order as if Tixati had been running the whole time. If the 'Prompt' option is selected, the Missed Scheduler Tasks window will appear upon startup if tasks have been missed. These will be the default options in the Add Scheduler Task window. These options will not affect any existing tasks. For more information about the Scheduler feature, click here.